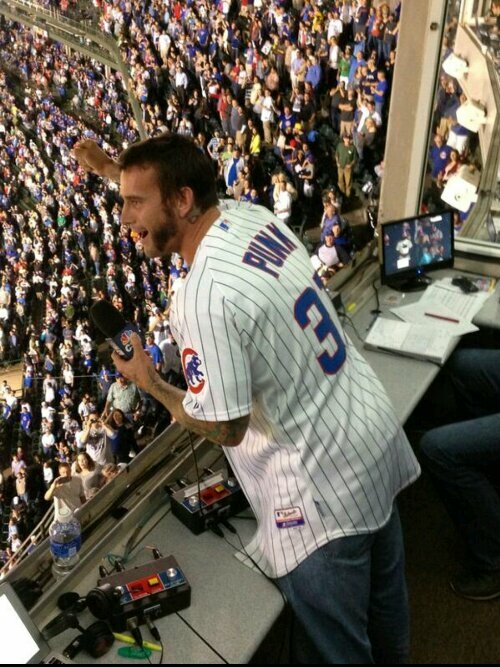 Chicago native and the self proclaimed “Best In The World” CM Punk sang “Take Me Out To The Ballgame” last night at the Chicago Cubs game. Channeling his inner Roddy Piper, Punk yelled out to the crowd that he was here to “chew bubblegum and sing”, and that he was all out of bubblegum. Sporting his Wolverine-esque beard, this was Punk’s third ballgame performance at Wrigley in as many years. Punk is no stranger to entertaining an audience, as the world will be watching on August 18th when he takes on Brock Lesnar at WWE Summerslam. P.S. I think Hot Rod’s all out of gum..
Posted on July 31, 2013, in Average Blog Posts, Wrestling and tagged baseball, Brock lesnar, chicago, cm punk, hot rod, me, MLB, roddy piper, summerslam, the, to, wrestling, WWE. Bookmark the permalink. Leave a comment.